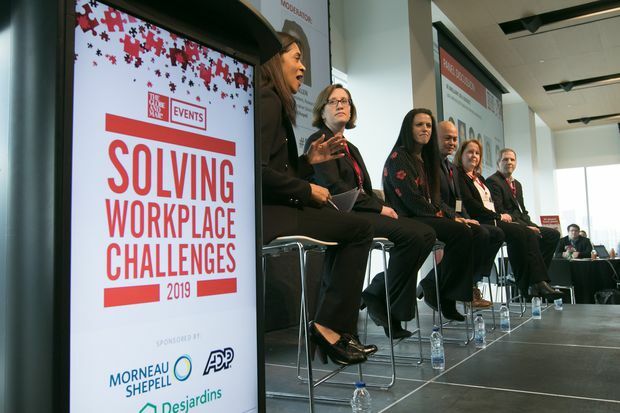 From left, Paula Allen from Morneau Shepell, Laura Strickler from ADP, Cerys Cook from The Pur Co., David Hong from OCAS, Kim Marshall from Innovative Automation, and Dave Reddy from Lifemark, explain inexpensive ways to boost workplace wellness on a panel at the 2019 Employee Recommended Workplace Award event in Toronto. There’s hard business science behind Popcorn Wednesdays. Or that celebratory cake in the cafeteria, the office softball team, the Friday potluck, or meaningful perks, such as flexible hours and work-from-home policies. All are enticements (some softer than others) aimed at the hard challenge of employee retention, a problem dogging countless businesses. Yet, can retaining talent be accomplished on the cheap with ephemera such as free company swag or cookies in the conference room? The truth is, there is a cold calculus in retaining employees. In other words, when the conversation around morale is less about cake and more about retention numbers, that’s when upper management takes action, he noted at a panel discussion on human resources issues at the Solving Workplace Challenges summit during the 2019 Employee Recommended Workplace Awards event, created by The Globe and Mail and Morneau Shepell and presented on March 19 in Toronto. For instance, physiotherapy clinics are Lifemark’s main line of business. Yet, the unemployment rates for physiotherapists in Canada is currently 0.6 per cent, so the competition to retain talent is extreme. About 30 per cent of new hires were quitting the company in the first year and a half. The competition to hire and retain physiotherapists is that fierce. “It’s a war for talent. We have to present the best employment brand,” Mr. Reddy said. Sometimes that can mean (somewhat counterintuitively) telling prospective hires about areas in which the company feels it could improve and giving them a very realistic picture of what it’s like to work there, so that new hires don’t feel led astray when they settle into the job. Another retention strategy is to focus on high-performing employees who may be at risk of quitting. Mr. Reddy recommends first gauging employees in terms of their future potential at the organization and their historical performance. After judging the higher performers by those criteria, “select out those you consider to be flight risks to the organization, and zero in on those with action plans,” he said. Every manager in contact with those at-risk, high-performing individuals should then communicate that action plan to them, he suggests. It sends the message that management cares enough to address their concerns meaningfully. “With that conversation alone, you’ve ticked up engagement about 10 points,” Mr. Reddy said. But then managers have to back this up with real action. One method is to focus on the top three things that the high fliers say personally motivate them. Maybe it is salary. Maybe it is decision making. Go with what they are looking for. Maybe it won’t cost the company more than granting simple recognition or greater autonomy. Just as importantly, this is a retention and morale method that managers can grasp, Mr. Reddy indicated. It’s more precise than, say, general team building; it is somewhat deeper thinking than Popcorn Wednesdays, even though all the panelists noted that some lightness, whether it is a scavenger hunt or junk food, helps to ease the mood. How else can managers improve retention, yet spend little? But she warns against applying policies to everyone arbitrarily from on high. “There are times when that makes sense, but some of the best things I’ve seen is when we’ve empowered the individual leader. They know their team,” she said. Allowing managers to customize work events or recognition to their departments can be more effective. Some companies are also thinking of eliminating the source of much workplace contention, the annual employee performance reviews, and possibly saving time and money in doing so. “I know a lot of companies are thinking about this. What do you replace it with, though?” asked Cerys Cook, vice-president of people and culture at the PUR Company Inc., which makes aspartame-free chewing gum. It depends on departmental managers, however, to pace those discussions with employees. “Different teams need more feedback than others. [The new policy] is really to customize it for each leader and each team,” she said. ADP is also going through the process of eliminating annual reviews, replacing them with something more meaningful. “Our leaders are excited about, frankly, not having that conversation and having more regular touch points [with employees]. We say, ‘You should know where you stand 52 weeks a year,’” said Ms. Strickler at ADP.